Can the DA once and for all leave behind the liberalism of Tony Leon? Whereas Frederik Van Zyl Slabbert and Alex Boraine were courageous and eventually stepped away from liberal opposition to apartheid, and went on to play significant roles in bringing about the political settlement of the late-1980s and early 1990s, Leon sought to “fight back” against the government of Nelson Mandela – while nobody was, actually, picking a fight with him. We may, surely, dismiss that as politicking. We will have to wait and see whether this is a mere bump on the road to next year’s election, or whether it points to a significant decline in overall support for the DA. The party would insist, no doubt, that they are doing well, overall. There have, nonetheless, been reports of growing resentment among the party’s coloured constituency in the Western Cape. If a week is a long time in politics, four or five months is an eternity. Anything can happen between the time of writing this, on a Saturday night in mid-December, and the 2019 election, probably at the end of April or early May. Nonetheless, as the standard bearer of liberalism in South Africa, the portends for the DA are not very good. This may be true, in part, because over most of the past two or three decades being described as liberal, by the left or right in South Africa, has been some kind of insult. It does not help, at the level of perception, that the traditional liberals have been mainly white people who were opposed to apartheid from 9 to 5, and then returned to their luxury and privilege after hours. Although this is somewhat of a caricature, it certainly has a ring of truth. There is, of course, a marked difference between the highs of, say, Van Zyl Slabbert or Boraine, the lows of Tony Leon, and the type of renaissance that Lindiwe Mazibuko, and then Mmusi Maimane seems to represent. Whereas Van Zyl Slabbert and Boraine were courageous and eventually stepped away from liberal opposition to apartheid, and went on to play significant roles in bringing about the political settlement of the late-1980s and early 1990s, Leon sought to “fight back” against the government of Nelson Mandela – while nobody was, actually, picking a fight with him. Leon represented “harsh reactionary” politics and led his party into a “cul-de-sac of conservatism” and his DA’s “disastrous ‘fight back’ campaign slogan positioned the DA as a party that stood against social change”. The other significant trend, other than that liberalism became an association with white privilege and the Leon leadership, is the global retreat of liberalism – at least the Western version. This issue has been covered extensively, and there is a growing scholarly literature around the decline of liberalism and the end of “the idea of the west”. Drawing on his own research, much of which was published in his book, The Retreat of Western Liberalism, Edward Luce explained that in 2017, there were 25 fewer democracies than in the year 2000, and that more authoritarian forms of government are becoming increasingly alluring. Most analyses would point to the election of Donald Trump as the clearest and most prominent sign of a decline in Western Liberalism, with a contiguous rise in fascism and ethno-nationalism around the world. Luce, the Washington correspondent for the Financial Times, explained that the election of Trump had shattered all illusions that if you gave people the choice, they would generally choose wisely. “That,” he said, “has been destroyed by Trump’s victory.” There is every possibility that this global trend has had emulative effects in South Africa. But what does all this mean for South Africa’s electoral outcomes in 2019? The short reply is: It’s hard to tell. There have been very many forms of liberalism over the time and place. Political parties that call themselves “liberal” have not always been, well, liberal. Australia’s Liberal Party is rather conservative. The Democrats in the United States have moved to the right in 1990s, or they have, since the Clinton Administration, held on to the Reaganite monetarism – a quite conservative political economy. There are folks who would refer to themselves as “classical liberals,” who are more right-wing libertarians. Both support a type of laissez-faire policies and expressly reject any redistributive action, including welfare state provisions and progressive taxation. This is typically motivated by an unshakable belief in the primacy of personal autonomy and protection from external interference, including, and especially, from the state. This places “the individual” above “the community”, and harks back to the Reagan-Thatcher era of politics. Like the ANC, and the EFF, for that matter (and in different ways) it is difficult to pin down the DA as any specific type of liberal party. One never can work out if the ANC is left of centre liberal, social democratic, socialist or communist – especially because of their alliance with the South African Communist Party. The EFF speak in Marxist-revolutionary tones but seem driven, in their day-to-day conduct by the politics of revenge, racialism, and quasi-militarism, with consequent violence – all of which has distinct parallels with 20th-century fascism. The EFF quite often seem obsessed with a biblical politics of punishment as an end in itself. Similarly confusing, it is not easy to identify what it is that you will get when, or if you vote for the DA. Do you get the liberalism of Gwen Ngwenya, who is more (Tony) Leonesque, and who was described by Carol Paton of Business Day as “super smart, articulate and super-conservative”? A Leonesque DA would have the market determine an allocation of resources and opportunities, the way that classical liberals, Reaganite and Thatcherite conservatives and libertarians may insist. Or do you get the DA of Maimane, who has much more left-of-centre leanings, and who has acknowledged that it was impossible to speak of creating a fair society without acknowledging the racially skewered (and unfair) starting point. This is more akin to factions in the ANC. And so, while the DA tries to turn a colander into a bowl, they seem to be shedding loyalties to the ANC. 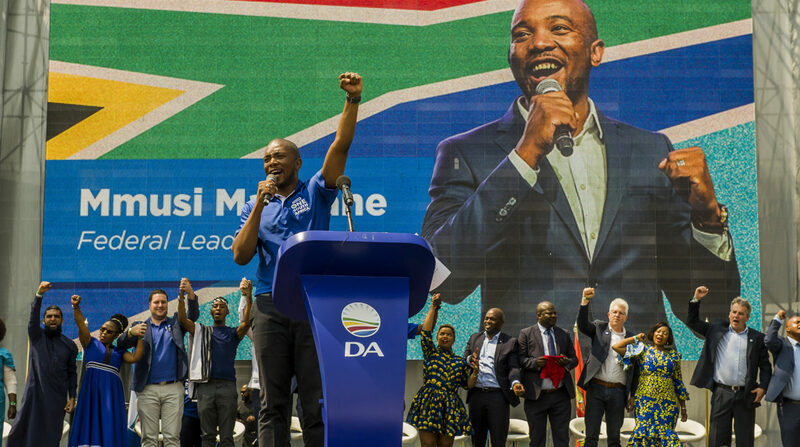 At the moment, four or five months before the next election, the DA may need to define itself more clearly and, as Ngwenya has said, “put clear water between the DA and the ANC”.